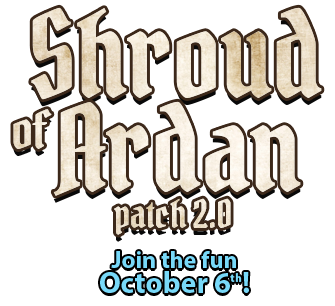 We are pleased to announce that we will be launching patch 2.0, Shroud of Ardan, on Friday, October 6th, 2017! We will announce the exact timing closer to that day, but plan on an evening (EST) launch. In the next two weeks, we will be making our new launcher app available for download. Shortly after, we will be hosting a preview so you can get a feel for the game, and test out the changes. Come and discuss this announcement in the 2.0 Shroud of Ardan discussion thread! This account is shared by the SBE staff to make announcements. Interested in playing Shadowbane? Check out our Getting Started page!